*sheepish smile* I’m sorry I haven’t been posting recently! I know you’ve missed me! 🙂 If it was up to Amy we’d have a post for every follower (Which, by the way we have seventy-five of those. You guys are awesome! Honestly, I’m amazed! Keep doing what you’re doing, you beautiful human beings! <3) and then some. Seriously, she’s been working like crazy and here I am with a Top Ten Friday! I guess you could say I keep things interesting. And tardy… But whichever way you would like to phrase this… Moving on now! A huge disadvantage of always posting after Amy is that Amy always steals all the authors and books that you showed her! Remember that in the future if you ever plan on writing with her! Because as we all know, Amy is going to be a famous author (as far as I’m concerned). I, of course, am going to become a famous singer, artist, fashion designer, astrophysicist, basketball player, and author. 🙂 Yes indeed, I am a blogger of many talents. And funny, too! How about that! As amusing as I find my one-sided conversations, other people might not feel the same. So without much more (not further, because I love ado) ado, I present to you my Top Ten Friday! This weeks topic is… (Drumroll, please. And yes, I’m a drummer.) Top Ten Authors You Really Want to Meet. I was struggling soo much! I couldn’t fit everybody!!! Ladies and ‘Gents, I present to you my new best friend, Marissa Meyer! I mean anyone awesome enough to write those books combined with my natural awesomeness… *insert mindblown reader here* I know, right?? But honestly, I so want to meet this person! Don’t you?? Read this: “Even in the Future the Story Begins with Once Upon a Time.” I hope you can hear me Marissa! Pretty soon our friendship will be so tight-kit and ancient that it will be considered a “once upon a time.” I don’t even know how or where I want to meet her. We’re just going to be friends for life. I honestly came so close to hating her in The One when I thought: A. Maxon was going to marry Kriss, and B. Maxon was dead. I was going to punch her. Knowing me, I actually would have. I want to meet her over lunch and get tea. She seems really nice and funny and it wouldn’t be awkward, and we would never run out of things to say. We might even get into a food fight or two, laughing the whole time. I don’t actually know what she’s like, but she can’t be horrible if she created America. Meet the two authors of my childhood. I’m definitely going to meet these two at a book signing. I know it’s a bit boring, but that’s how I imagined it. Sorry to disappoint. Next! She is so pretty! Ugh! I think it’s pretty obvious what we would do together: SHOPPING SPREE!!! And then, we would watch Gossip Girl together and talk about how horrible Blair is! She is also very gorgeous! I love her eyes! She looks like Calaena! Gaaaaaaaaaa! I think I would meet Sarah at an art gallery. She seems very artistic in this picture. Don’t you think? That headband, tho. (Yes, that was my lame attempt to be Ghetto. I think I ruined it with a comma. :)) Then, we would go to this new, hip coffee shop. Delirium, man. Delirium. I’m growing delirious because I really want to meet this author! (Corny joke alert!) Ok, so… We will be walking around quietly in a beautiful Japanese garden, and strangely enough, we bump into each other! I love Claudia Gray, but she’s not one my all-time favorite authors ever. I honestly want to meet her to find out what the heck is happening with Paul and Marguerite!!!!!!!!!!! Gaaaa! We will meet in FBI headquarters because I plan on interrogating her. Plain and simple. I also love Lois Lowry, Cassanda Clare and many others! 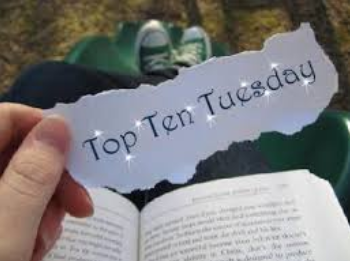 Next ›The Perfect Top Ten Tuesday!